One of the few things I actually get requests to make is cobbler. It’s delicious and insanely easy to make. Normally I use my mom’s old school method of combining 1 stick of butter and 1 cup each of milk, sugar and flour. Then you dump the fruit on top and bake. That’s it. For real. It’s embarrassing how easy it is. Then I stand over the oven eating forkfuls of blackberry heaven. But sometimes you want a lighter version, right? 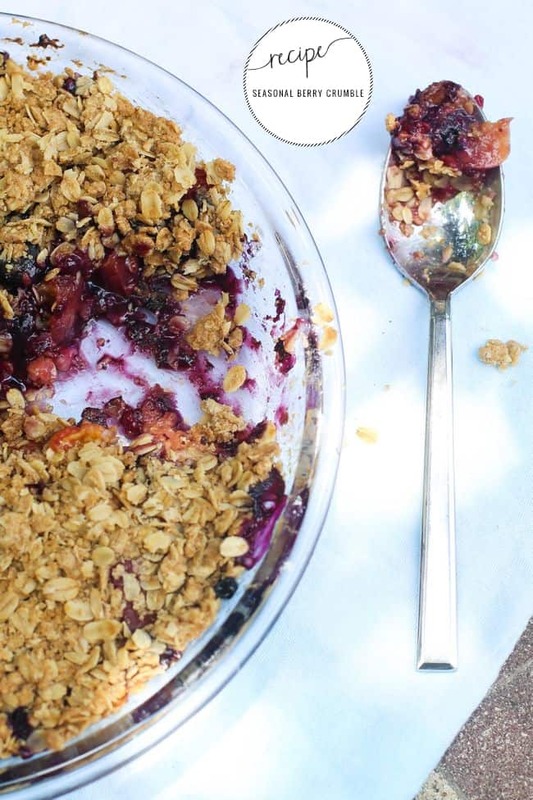 Enter my new famous crumble. Guys, this stuff is awesome too. And pretty much just as easy to make. You get to go easier on the flour and sugar and heavier on the fruit. So combine whatever is in season – berries, peaches, apples, whatever. My favorite combo is blueberries, peaches and blackberries. Then make sure you get a bite – there’s no shame in standing over the oven with a fork! – because it’s crazy how fast this disappears. Combine the fruit with the 1 tablespoon of flour in a 9-inch pie pan or similar-sized baking dish. Mix the rest of the ingredient together in a bowl, using your hands to form pea-sized crumbs. Sprinkle the topping over the fruit. Bake for 45 minutes, until the topping is browned and the fruit juices are bubbling. Serve warm, and with ice cream for added tastiness! This sounds AMAZING. In fact, I’m totally going to make some tomorrow for my girls night in! I like to think that any dessert made with fruit is healthy (IT IS, right?! ), but yeah, maybe cutting down on the flour and sugar is a good idea. :) Especially because it helps make up for the big scoop of ice cream I’d put on top of this. Oh how I love cobbler! Thanks for sharing – the peaches at our farmers market have been really good lately so I will have to grab some this weekend for a peach cobbler! Ah, I love a good crumble or crisp! 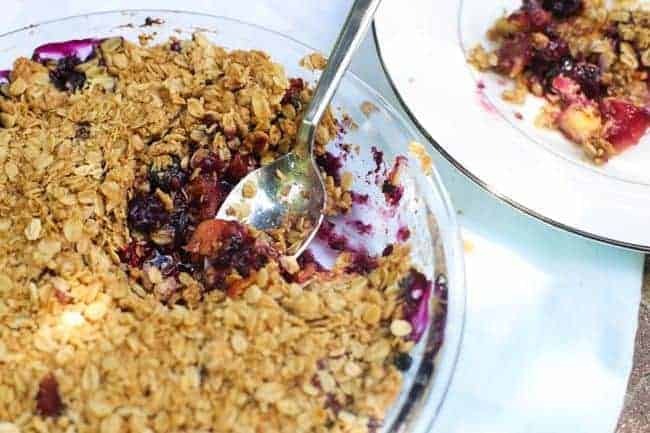 I made a delicious blueberry peach crisp a couple of weeks ago, and I’m whipping up a peach crisp tomorrow!